These kids really are three little angels! A Canon Speedlite 430EX II was triggered by a Canon ST-E2 Remote Transmitter and fired into a white umbrella for this portrait. The out-of-the-camera gray background was made white in Photoshop. Three cute kids on stools. I wish I would have noticed the oldest's feet switch. A portrait of a cute girl. A little girl posing for her portrait. Shot from a stool - a picture looking down at three girls. Three kids on three stools. A little girl balances on a stool in this picture. Aim a Canon Speedlite 320EX into a 60" umbrella and this is the lighting you get. The subject is positioned near a white wall. The close distance to the wall prevents the light from falling off too much - keeping the wall relatively bright. Good portraits do not require a straight-on look from your subject, but good portraits usually need both eyes in the frame. Do not let the subject turn their head far enough for the nose to block an eye. A white reflector was used to bounce some fill light into the picture. The setup used for this portrait is about as simple as studio-grade lighting gets. 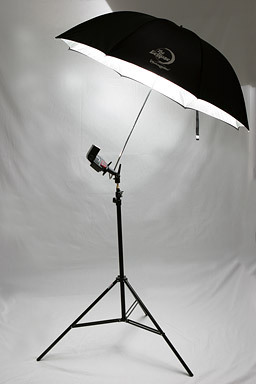 One 60" umbrella with an inexpensive Canon Speedlite 320EX fired into it. The flash was remotely triggered by the Canon EOS 60D. The background is simply a white wall with the light feathered down over it. A white reflector was used to bounce some fill light into the picture.